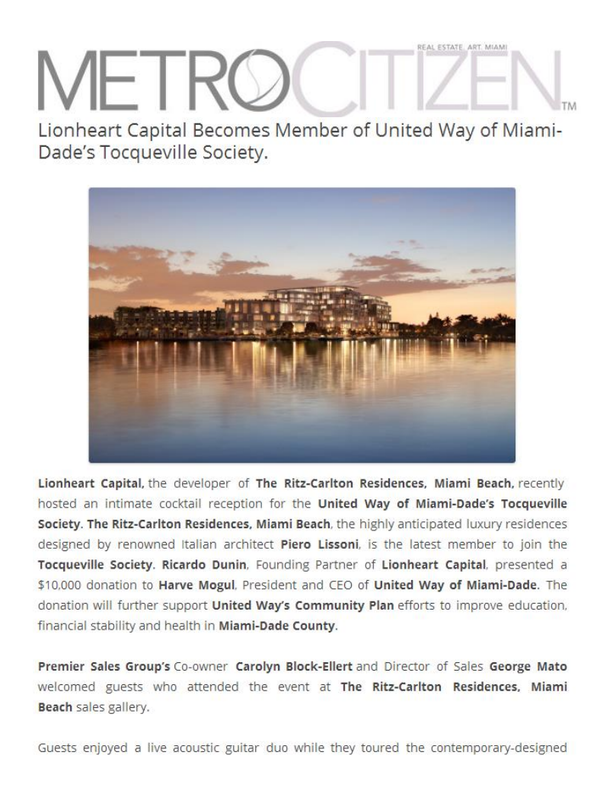 Lionheart Capital, the developer of The Ritz-Carlton Residences, Miami Beach, recently hosted an intimate cocktail reception for the United Way of Miami-Dade’s Tocqueville Society. The Ritz-Carlton Residences, Miami Beach, the highly anticipated luxury residences designed by renowned Italian architect Piero Lissoni, is the latest member to join the Tocqueville Society. Ricardo Dunin, Founding Partner of Lionheart Capital, presented a $10,000 donation to Harve Mogul, President and CEO of United Way of Miami-Dade. The donation will further support United Way’s Community Plan efforts to improve education, financial stability and health in Miami-Dade County. Premier Sales Group’s Co-owner Carolyn Block-Ellert and Director of Sales George Mato welcomed guests who attended the event at The Ritz-Carlton Residences, Miami Beach sales gallery. Guests enjoyed a live acoustic guitar duo while they toured the contemporary-designed sales gallery, which features a high-tech media wall, including holograms, an interactive presentation, and dioramas of the project as well as a screening room which features a short film about The Residences. Attendees also enjoyed specialty cocktails as well as delectable hors d’oeuvres and desserts by Thierry’s Catering. The evening concluded with guests enjoying cocktails on the Sales Gallery’s outdoor patio overlooking Surprise Lake, which showcased on a private dock a 2014 VanDutch 40, offered for sale by HMY Yacht Sales, that residents will be able to enjoy. There will be 35 boat slips available for purchase The Ritz-Carlton Residences, Miami Beach, offering appeal to boaters. Harve A. Mogul, President and CEO of United Way of Miami-Dade; Alicia Cervera Lamadrid, Managing Partner of Cervera Real Estate and United Way of Miami-Dade Tocqueville Society Cabinet Co-Chair; Alan T. Dimond, Shareholder at Greenberg Traurig Law Firm and United Way of Miami-Dade Tocqueville Society Cabinet Co-Chair; and Pedro Fernandez, United Way of Miami-Dade Tocqueville Society Cabinet member were among the notable attendees.